Didn’t I mention something about cake? Cookies? Something toothsome, gooey and sweet? I swear this isn’t turning into a breakfast/vegan blog (not that there’s anything wrong with that), but this is how I’ve been eating lately. It’s spring outside…or at least it’s trying to be and I think it’s time for a dietary shake up for a bit. The cake and cookie recipes will come, I promise! Last week I picked up Mark Bittman’s hefty cookbook, How to Cook Everything and found myself at his granola recipe. It intrigued me since it required no oil and there was a suggestion to throw quinoa or millet into the mix. It got me thinking, and just a few minutes later I found myself heading to the cupboard making up a low fat granola recipe. Now, I’m no slouch when it comes to making granola. My recipe archives contain recipes for peanut butter granola, cocoa-coconut granola, vanilla almond granola, and my no-fail granola. But despite my granola cred, I’ve never added millet. And dear readers, millet is a granola god-send! It adds such a snap, crackle, pop for the perfect bite of crunch. As for the no-oil, I couldn’t detect much difference between this one and my normal granola, so why not choose the low fat version instead? It’s delicious, filling and healthy breakfast and if you prepare a batch every Sunday evening then you have something to look forward to all week long. Heat oven to 300F. In a large bowl, combine all the ingredients from the oats down to the salt. Drizzle in the maple syrup and stir well with a wooden spoon to get everything coated. Needs more liquids? Add in some more maple syrup or a bit of orange juice. Spread the mix out into a large baking dish and bake for 30 minutes, checking and stirring occasionally so that nothing burns. Add in the raisins and cranberries and bake until the granola turns golden and crisp, again making sure things don’t get too “golden”. Remove from oven and cool. Store in a sealed container. Serve with fresh fruit and yogurt. i am curious though, if you were to use quinoa, could you just throw it in uncooked? If so, I had no idea you could eat uncooked quinoa (or millet for that matter)!!! this opens up a whole new window! Crafty Ash, the millet (and quinoa if you use it) is uncooked. Use the uncooked grain…it bakes into a crunchy bite of goodness! I have a granola recipe that I love but it is a little over the top in the butter department. I love that this doesn’t have any additional fat. I have to try it! Sounds absolutely delicious and super healthy! Instantly bookmarked!! A perfect way to start your healthy day. I get tired of the sweets too, and start to just give my baked/experimented goods away. All that stuff builds up in my blood and makes me feel sluggish. I love a good granola that is made all natural, not loaded with sugar and honey. I love granola, and this recipe sounds incredible. I’ve never thought to add something like millet. Thanks for the idea! Ooo I’ll have to try adding millet to granola the next time I make it! I recently tried making granola with just sugar and no oil too. I’m wondering if oil (added in sufficient quantity) helps things to clump together more? Whereas if you just add sugar it will help to make it crispy. 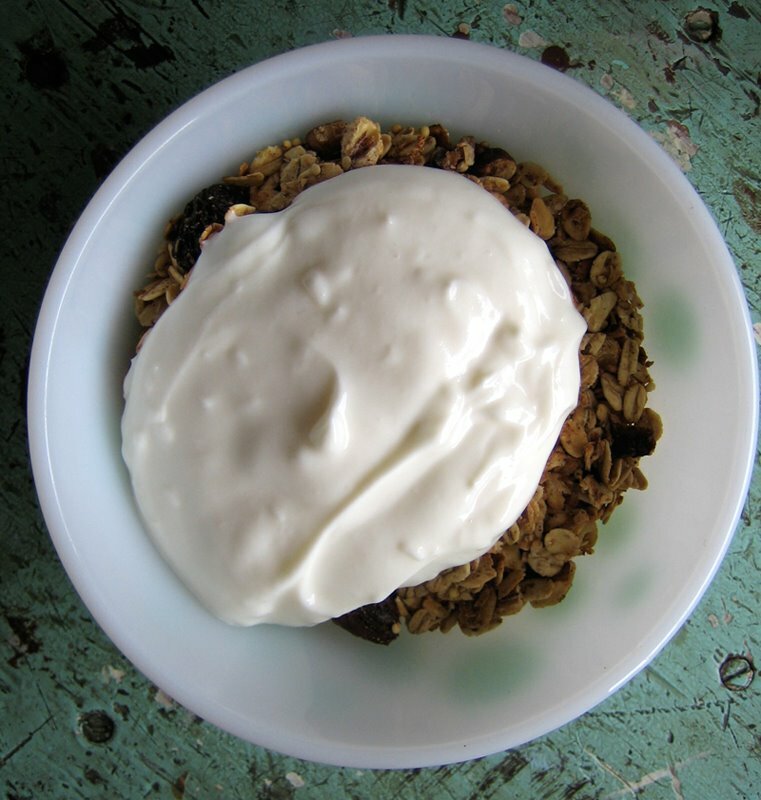 I love granola and am always looking for lower fat versions. This one sounds really good. I hope to try it soon! I found out about mark bittman watching pbs…and was very intrigued by his book. what do you think of it so far? LOVE millet!! I’m not usually a big granola fan, but I bet the millet makes it so delicious! I’ve tried two of your granola recipes (no-fail and cocoa-coconut) and they were both delicious. 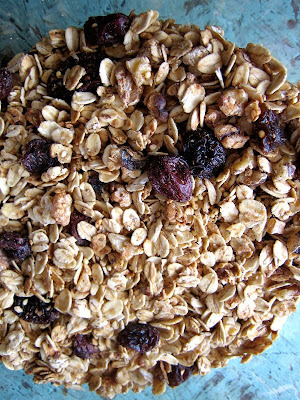 I love crunchy granola and all those nuts in this recipe are perfect for a nut-lover. I haven’t been cooking much lately due to my hectic work schedule, but I will bookmark this for a later date. I just discovered your blog and am excited! In fact, I was just saying to my hubby while we sat in the ski lodge eating a Mojo bar, “I really need to find a way to re-create this bar”. Ash, maybe you can figure it out! In the meantime, I will be making this granola! Spud, granola is my favorite! Thanks for dropping in Varsha. Tartelette, definitely super healthy…and everyone could use a healthy breakfast, right? Oooh Dawn, pass ’em my way! Hayley, it’s a good experiment the millet! Eatme, I did once try a granola bar recipe that didn’t end up working but it did make a good granola and it was sticky and clumpy…I think it had loads of melted butter and honey! Sarena, this is definitely a low fat healthy option. Hag, I’m not in love with his book, but I think it’s a good introduction to people who aren’t used to cooking. Cookiepie, the millet adds a crunchy dimension. Bijoux, you could make a batch on Sunday and then it’s there for the rest of the week! This looks amazing. I have been searching high and low for a granola recipe that makes my ears prick up and my stomach grumble… I think I’ve finally found it! I made this over the weekend and it was amazing! I used quinoa in place of millet, and omitted the dried fruit. Awesome breakfast. This recipe is intriguing. I've never seen a granola recipe where the dried fruits are added before the granola is done baking. Do you like the texture? 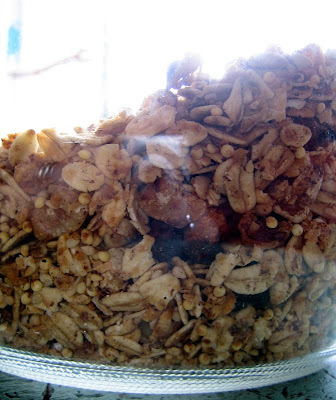 Does the fruit get drier or chewier, or is it pretty similar to the texture of dried fruit added to baked and cooled granola? amanda, so glad that you loved this! rosiecat, I do like the texture of raisins that have been baked – they are much chewier and more leather-like (if you bake them long enough) but I do like that! I don't like adding raisins once it's out of the oven, for me, it's what's the point? But that's my own bias! Paola, this isn’t the clumpy style of granola – want the clumps? Add more sweetener & some butter. Not sure what you mean about one dimensional in the crunch factor. The millet is crunchy and it’s a different kind of crunch than the oats. OH, I can’t wait to try this. I am on a millet kick. I pretty much have been eating it every day for about a week. I think I am able to run faster, jump higher, and smile brighter because of it. Ok, maybe I exaggerate…but only a little.